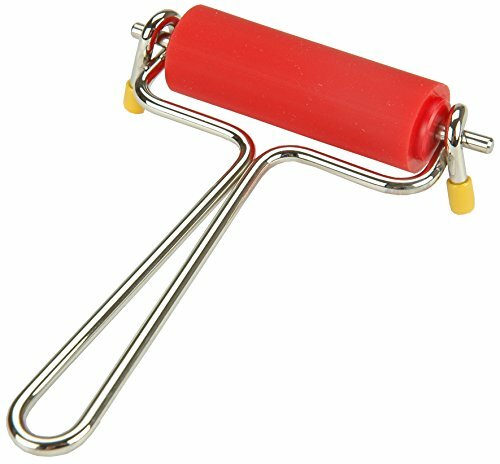 SOFT RUBBER BRAYER - This 4 inch soft brayer is ideal for all types of block printing. It is made from soft, natural Latex gum rubber with a precision ground finish. The flexibility of the 40/42 durometer makes for even ink distribution. STURDY STEEL FRAME - The brayer has a heavy duty steel frame that eliminates warping. It will not bend or break. This roller is ultra tough. MADE IN THE USA - The Speedball Deluxe Soft Rubber Brayer is proudly made in the USA. For use with any water-soluble or oil-based block printing inks. Speedball's Deluxe Hard Rubber Brayer features a 4" synthetic rubber roller (80 durometer) that is ideal for light carving or gluing applications or for rolling down prints and other graphic projects. The durable plastic handle makes for a comfortable grip. 2 Pcs 3. 8 and 2. 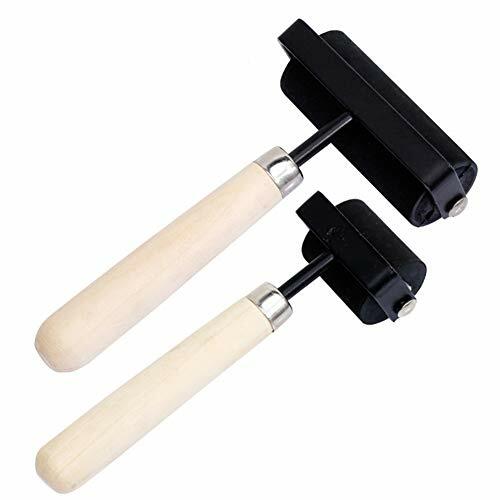 2 Inch Rubber Brayer Roller Glue roller ideal for Anti Skid Tape Construction Tools Printmaking, Ink Paint Block Stamping Brayers Rubber brayer is a must have for your tool box: Our stamping brayer distributes ink or glue for a smoother, cleaner and professional finished. Package Include: 1 x 3. 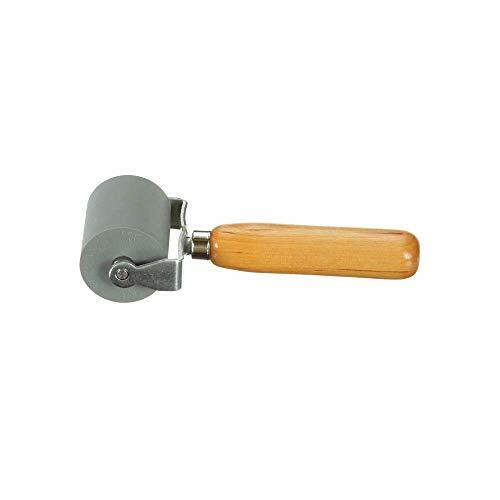 8 Inch rubber brayer 1 x 2. 2 Inch rubber brayer How to use and clean: 1. The brayer moves with easy and don't need to press hard for the roller to move. 2. Clean the roller off with soap and warm water. Wipe clean with a paper towel or washcloth. 3. There is a hole in the handle, which can be hung after cleaning. After-sales: If you are not satisfied with any quality problem of our product, please kindly Email us before you leave the review, we will give you replacement. Dimension: 3. 8 and 2. 2 inch two size available, very suitable for daily basic needs and feels great in your hand. 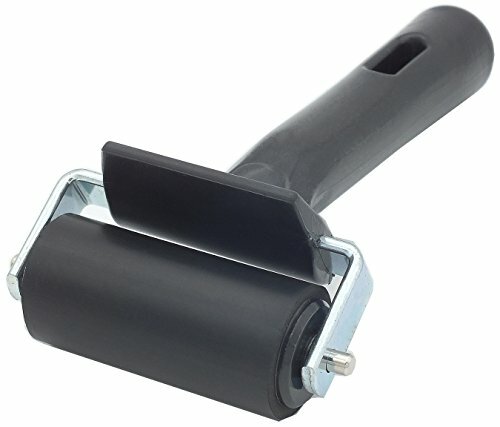 4-Inch Rubber Brayer Roller for Printmaking, Great for gluing application also. Falling in Art rubber roller is ideal for anti skid tape construction, printmaking, inking blocks, carved surfaces or stamping, scrapbooks, paintings, etc. 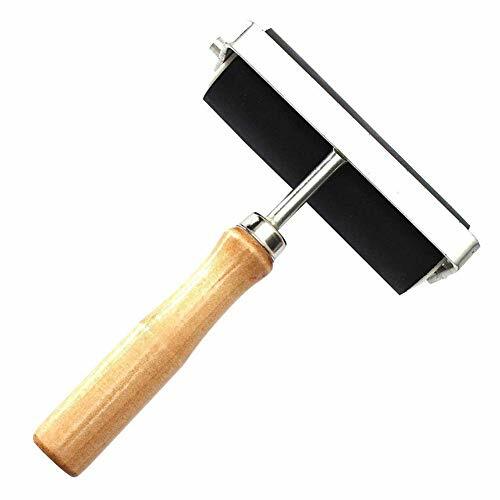 SOFT RUBBER BRAYER - This 6 inch soft brayer is ideal for all types of block printing. It is made from soft, natural Latex gum rubber with a precision ground finish. The flexibility of the 40/42 durometer makes for even ink distribution. Specifications: Width: 9.7 cm/ 3.8 inches and 5.6 cm/ 2.2 inches Material: rubber, steel and plastic Color: black The smooth surface help you to distribute ink or glue evenly to finish printing and stamping, and they are also suitable for inking blocks and carved surfaces. This set of brayers is good for printmaking, scrapbooking, paper crafts, home decor, inking blocks, carved surfaces printing, and necessary domestic supplies. The brayer moves with ease and no need to press hard or work hard for the roller to move; Can give you comfortable touch feel and pleasant user experience. The rubber roller is with simple structure and is easy to use with durable plastic grip handle. This roller is good for distributing ink or glue evenly to finish printing and stamping smoothly and cleanly; Also good for inking blocks and carved surfaces. This set of brayers are good for printmaking, scrapbooking, paper crafts, home decor, inking blocks, carved surfaces printing, and necessary domestic supplies. 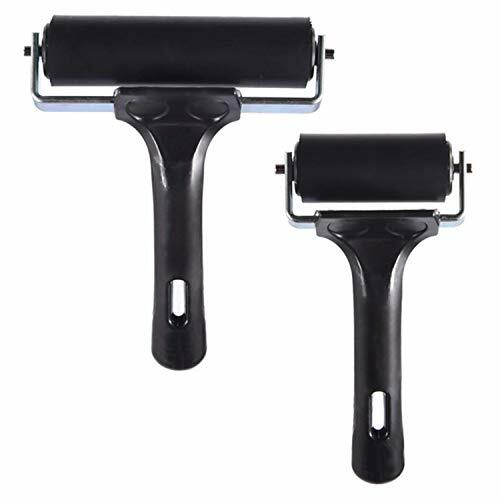 The package includes 2 pieces of rubber brayers in black color with 2 different sizes; one is 3.8 inches, the other is 2.2 inches, common size can meet your daily needs. 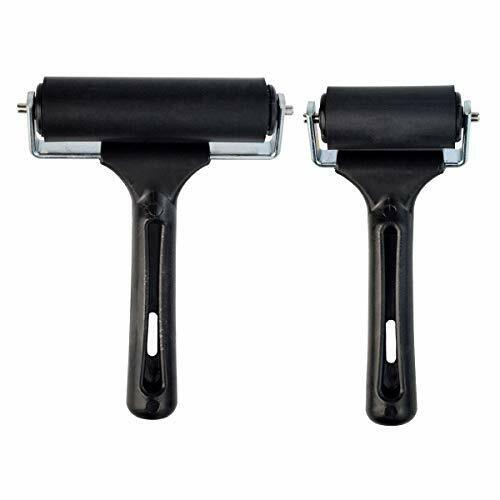 PACKAGE INCLUDES: 2 pack brayer, 3.8 and 2.2 inch, common size can meet your daily needs. 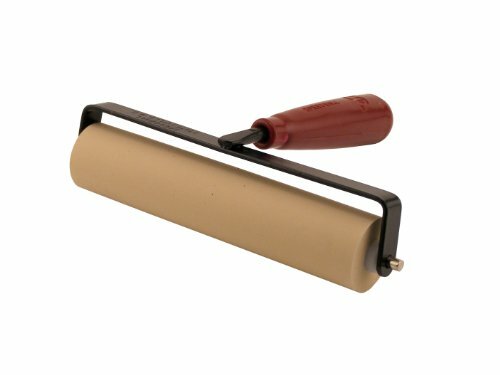 This roller is good for distributing ink or glue evenly to finish printing and stamping smoothly and cleanly; Also good for inking blocks and carved surfaces. The roller is made of high quality rubber, sturdy and durable, with good elasticity; The handle is made of nonslip plastic handle,easy to grip and easy to operate. EASY TO USE: The brayer moves with ease and no need to press hard or work hard for the roller to move; Can give you comfortable touch feel and pleasant user experience. MULTIPLE USAGE: These rollers ideal for inking blocks, carved surfaces for printmaking, printing,scrapbooks, wallpapers, etc. This roller brush is a very useful art tool for painting or printing or stamping.As a good painting tool, which is capable of painting large area very quickly. 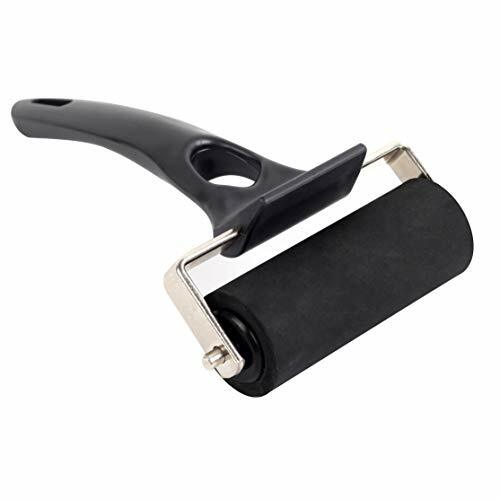 Soft Rubber Brayer A handy, durable brayer for use in non-slip tape installation, making sure the tape is firmly contact with the surface. Distribute Evenly This roller is also perfect for inking blocks or carved surfaces for printmaking and rolling down print surface. Sturdy Painted Steel Frame The brayer has a heavy duty steel frame that eliminates warping,not blend or break. Comfortable handle The strong wood handle is comfortable and feels great in your hand. Quick and Easy Clean Clean the roller off with soap and water.Wipe clean with a paper towel or washcloth. 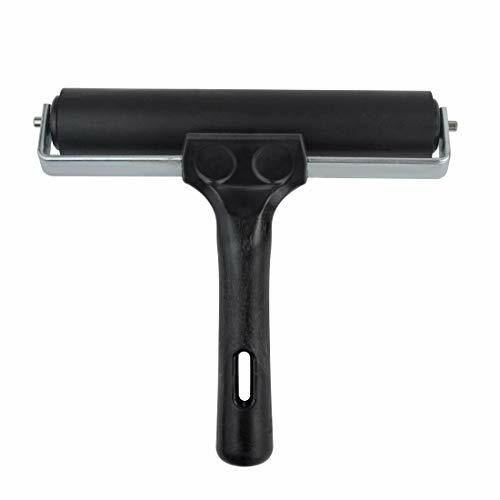 MyLifeUNIT Soft Rubber Brayer Roller is perfect for block printing, this deluxe hard rubber brayer is ideal for light carving or gluing applications, excellent for rolling down print surfaces. 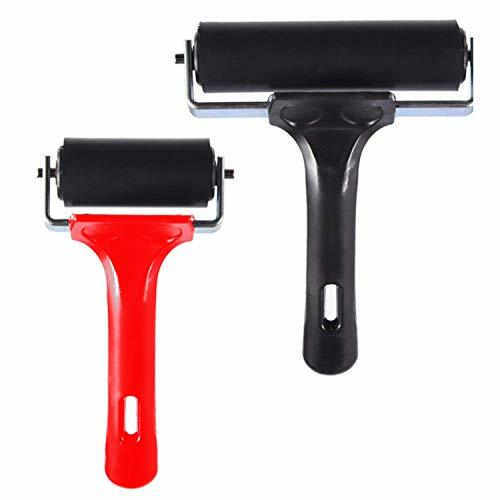 Made of soft rubber of the roller and the strong wooden handle, strong and durable, perfect for inking blocks or carved surfaces for printmaking and rolling down print surface. Heavy stainless steel frame fasten the rubber roller very well, won't break and eliminates the warping and damage. With a hard wooden handle crafted to the perfect size for comfort, helps prevent uncomfortable hand cramping for a more enjoyable user experience. Smooth surface of the wooden handle give you the comfortable holding feelings, you won't feel tired even hold it for a long time. Roller Part Size 32 x 38 mm / 1.3 x 1.5 inch, no need to press hard or work hard for the roller to move, convenient to use. The plastic handle on the rubber brayer is super comfortable and feels great in your hand. All dimensions are measured manually with deviation range at 0.1-0.5inch. If by any chance they are not, we are sorry for that. PACKGING 2PCS in one Package, 2 sizes . 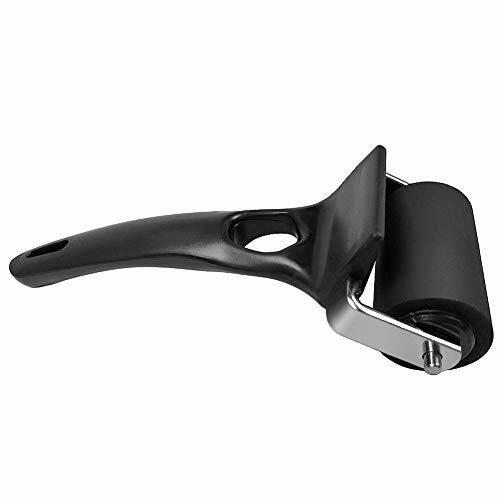 COMFORTABLE HANDLE The plastic handle on the rubber brayer is super comfortable and feels great in your hand. Helps provide a firm bond when applying slip-resistant tapes and treads. The rubber roller head is not replaceable separately. 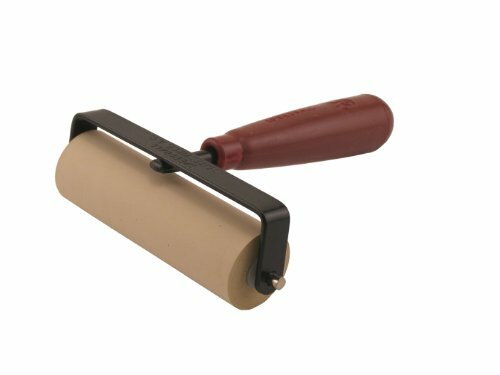 SOFT RUBBER BRAYER - This 2-1/2 inch soft brayer is ideal for all types of block printing. It is made from soft, natural Latex gum rubber with a precision ground finish. The flexibility of the 40/42 durometer makes for even ink distribution. 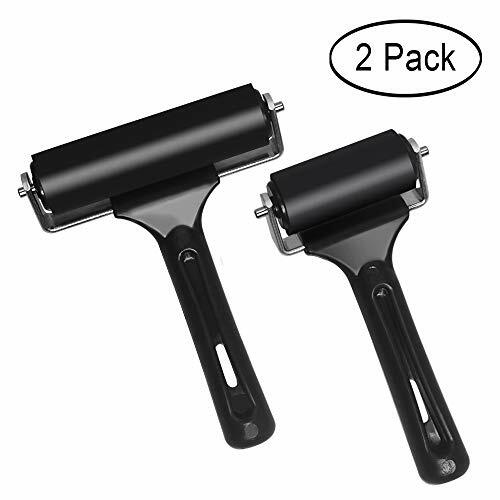 2 Sizes of Roller Length----3.8" and 2.2"
This rubber brayer roller is ideal for inking blocks, carved surfaces for printmaking, printing, scrapbooks, wallpapers, etc. It is good at spreading ink or oil paint, or glue evenly on smooth surface. The roller is made of high quality rubber, sturdy and durable, with good elasticity. Durable plastic grip handle, easy to grip and easy to operate. 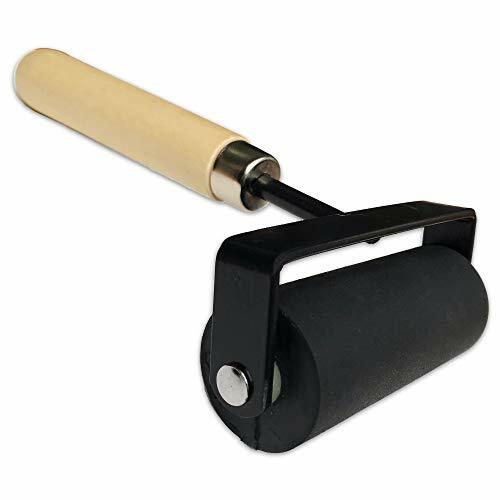 Roller Length: 3.8" and 2.2"
This Rubber Brayer Roller is perfect for block printing, light carving or gluing applications, rolling down print surfaces. MULTI-FUNCTION: This roller is good for distributing ink or glue evenly to finish printing and stamping smoothly and cleanly; Also good for inking blocks and carved surfaces. 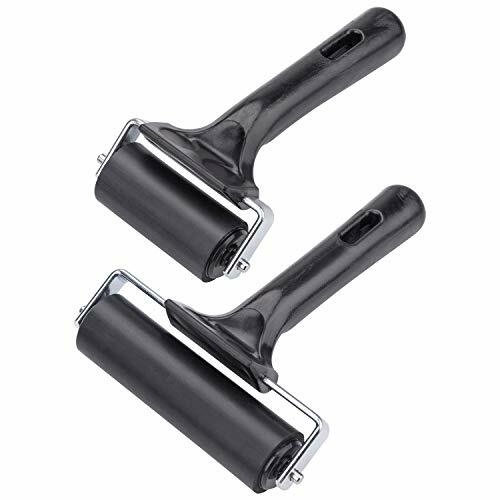 2 SIZES AND 2 COLORS: Black one -- roller length 3.8, handle length 4.6. Red one --roller length 2.2, handle length 4.6. EASY TO USE: The brayer moves easily, no need to press hard or work hard for the roller to move, convenient to use. 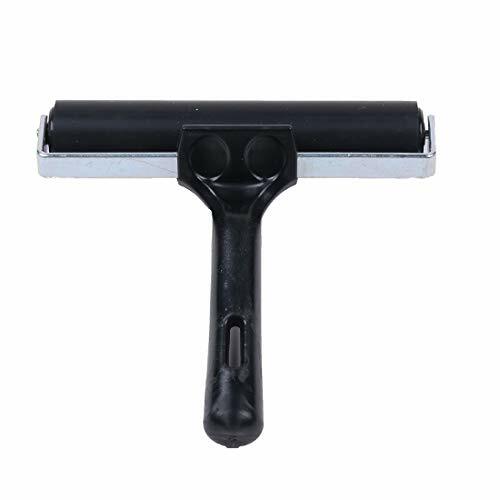 HIGH QUALITY: The roller is made of high quality hard rubber, sturdy and durable; The handle is made of nonslip plastic handle, easy to grip and easy to operate. STAINLESS STEEL FRAME fasten the rubber roller very well, won't break and eliminates the warping and damage. --Material: Made by premium quality wood, stainless steel and soft rubber. It is sturdy and durable for your daily use. --Comfortable handle: Solid & firm hard wooden handle crafted to the perfect size for comfort, helps prevent uncomfortable. 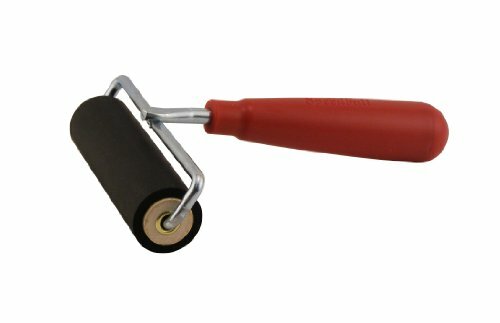 --Wide application: The hard rubber roller is suitable for Printmaking, Vinyl, Block Printing, Acrylic Paint, Card Making or any other art crafting. One is 6.3"L*3"W*1.8"H, another is 6.3"L*1.5"W*1.8"H.
Material: Made by premium quality wood, stainless steel and soft rubber. It is sturdy and durable for your daily use. Easy to use: The rubber roller is with simple structure and is easy to use. Comfortable handle: Solid & firm hard wooden handle crafted to the perfect size for comfort, helps prevent uncomfortable. 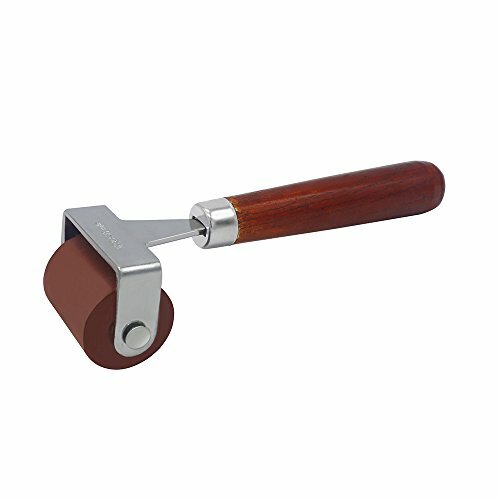 Wide application: The hard rubber roller is suitable for Printmaking, Vinyl, Block Printing, Acrylic Paint, Card Making or any other art crafting. What You Get: Comes with 2 pack rubber roller tool. One is 6.3L*3W*1.8H, another is 6.3L*1.5W*1.8H. Easily spread ink and glue for printing,scrapbook,wallpaper and stamping. Perfect for printmaking,rolling down prints and other graphic projects. Heavy metal frame eliminates warping and the handle is designed for comfortable grip. Simple structure,easy to use. SERVICE:If you have any questions about this stress relief ball,you can contact us by email and we will answer you within 24 hours. Note Please allow 1-2 cm error due to manual measurement. Please make sure you do not mind before you bid. The actual item's color maybe slightly different from the picture shown due to the lighting when the picture was shot. SERVICE:If you have any questions about this stress relief ball,you can contact us by email and we will answer you within 24 hours. Perfect for printmaking,rolling down prints and other graphic projects. Easily spread ink and glue for printing,scrapbook,wallpaper and stamping. Heavy metal frame eliminates warping and the handle is designed for comfortable grip. This roller brush is a very useful art tool for painting or printing or stamping. As a good painting tool, which is capable of painting large area very quickly. Simple structure with nonslip plastic handle, easy to grip and easy to operate. --Comfortable Handle: Curved handle fits more perfectly into your palm than the previous handle. --Easy to Use: The brayer moves with ease and no need to press hard or work hard for the roller to move; Can give you comfortable touch feel and pleasant user experience. 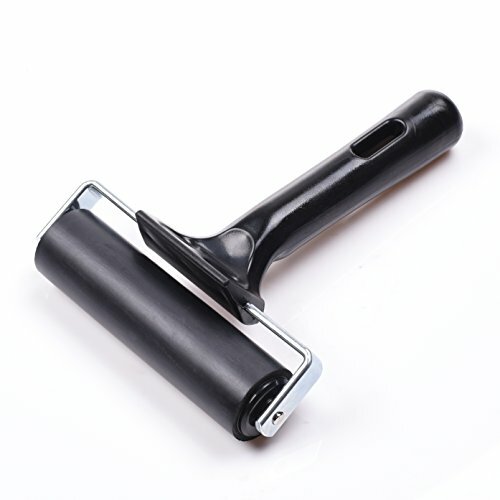 --Wide Application: This brayer is good for printmaking, scrapbooking, paper crafts, home decor, inking blocks, carved surfaces printing, necessary domestic supplies. Comfortable Handle: Curved handle fits more perfectly into your palm than the previous handle. Smooth Surface: 2'' width X 1 1/5'' thick, 6 2/7'' length, good for distributing ink or glue evenly to finish printing and stamping smoothly and cleanly. 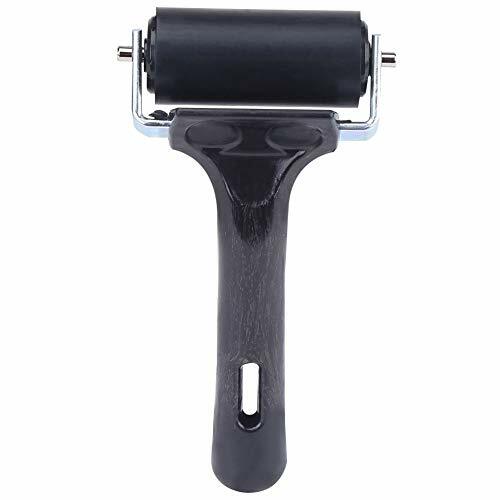 Wide Application: This brayer is good for printmaking, scrapbooking, paper crafts, home decor, inking blocks, carved surfaces printing, necessary domestic supplies. Warranty: 90 days money back warranty. Any questions you have, please don't hesitate to contact us.